Nutcrackers are traditional representations of strength and power, given as keepsakes to bring good luck to your family. The Nutcracker bears its teeth to protect homes from danger and evil spirits. As a trusty guardian, the nutcracker brings the traditional message of good will and prosperity to every home. With a touch of paint and a little whimsy, CAF Creations makes your classic nutcracker stand out among the rest! 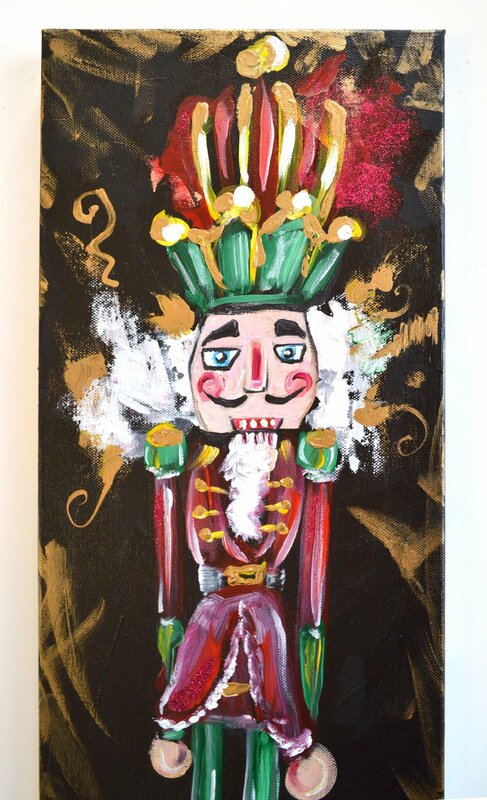 Each nutcracker painting is original acrylic artwork on 8" x 24" canvas illustrated with impressive detail, textures, iridescent paint and a little touch of sparkle! Buy your nutcracker for $89. Place Your Custom Order Here! ***Once you submit your custom form, your order will be confirmed via email within 1 business day. To complete your order, you will need to click the “PROCEED TO CHECKOUT”. If you have any questions, do not hesitate to reach me by phone, 585-406-6420. Select a Theme from the list above. If you have a theme or special request, please address it in the comments below! Thank you for your submission :) Please proceed to check out by clicking the button below!